Welcome to Discover Port Huron–Your Bridge to the Port Huron Area! Bridges are to help us cross over obstacles or barriers. Discover Port Huron is here to help you navigate the choices in planning a relaxing, fun-filled vacation in the Port Huron area. Come and find yourself relaxing along the shoreline of Saint Clair River or the great Lake Huron. There is something special and tranquil about the blue and turquoise waters dancing as they flow southward. Many people make it a hobby of viewing cargo ships cruising north and south along the 75 miles of shoreline from Saint Clair, Marysville, Port Huron, Lakeport, and Lexington. At the mouth of Lake Huron spans the breathtaking view of the two Port Huron Bridges. The Port Huron Bridges are an international link between Port Huron, Michigan, U.S.A., and Sarnia, Ontario, Canada. In the summer there are festivals with carnival rides, live music, boat races, and a 4H Fair. Many surrounding towns have festivals celebrating and displaying their own personal history. The most important sailboating is the annual Port Huron to Mackinac Island race. Boats from all over the country compete in this prestigious race with various sizes and styles of boats. 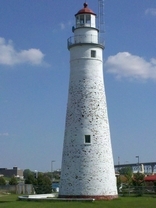 The Port Huron area of Michigan is full of history. The nautical and fort history is significant enough, and some famous residents like Thomas Edison add to the attraction. Visit Port Huron and the rest of the Port Huron area to experience the fun and excitement that is here every week. There is always something to do. Summer festivals, fall events, winter sports and the beauty of spring are unique here. Any information you may need to fully enjoy your visit can be found here at Discover Port Huron, so take a look around and enjoy your visit. We help many visitors cross the bridge to discover the sights and wonders of the Port Huron area. Come and experience it for yourself. We look forward to seeing you soon!